This is a unique Kiddush cup. 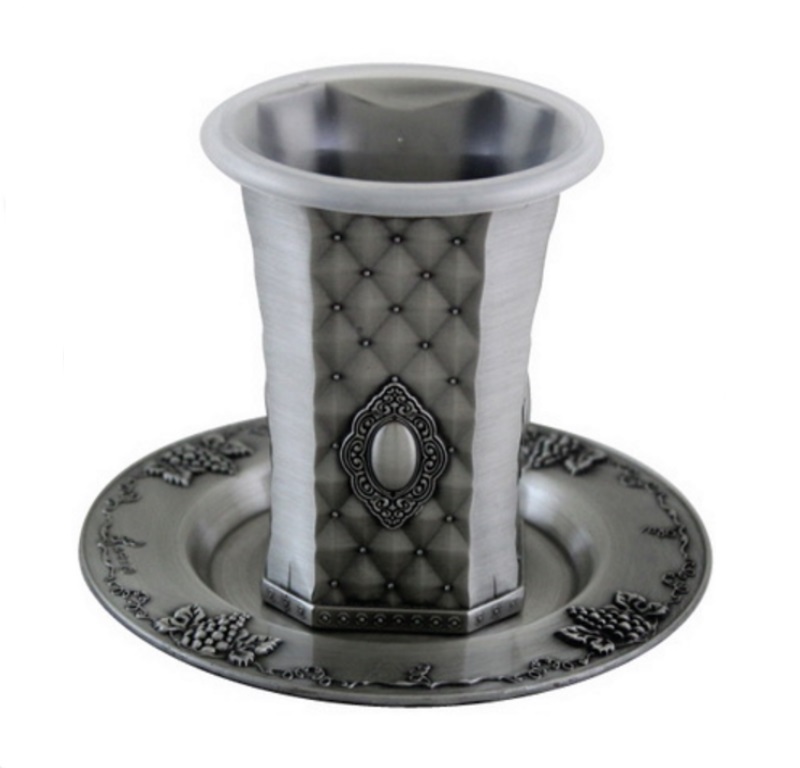 It is made from Pewter and comes in a delightful combination of metal grey color, highlighted with dark shadows. The cup comes in a set with a saucer. The set has been made with care and perfection, to ensure that your wine taste better than it ever did before. This particular Kiddush cup and saucer set is one which is definitely going to be a delight on your Sabbat table. The cup features an unconventional design, with dark and light sections. The dark section has a diamond shaped texture with an almost royal-looking motif at the center. The saucer has been embellished with floret engravings. The Judaica set is very stable and likeable. It has been polished to increase the shine life and needs the least maintenance. Therefore, you can expect the set to be the centerpiece of your Shabbat table for many years coming. The Kiddush cup has a spiritual significance for the Jews. It is used to initiate the Sabbat ceremony and sanctify the mitzvah. The set comes in top condition and will reach your home in a secure packaging. It also makes for an exciting gift for your close friends and family, on any special Jewish occasion.